The new Phil Knight Science Center and the transition of Hayward Field to a more European-style track is putting Eugene, Oregon back on the map with regard to student housing investments. The visibility created by these new constructions will not only impact the quality of athletes that come to the University of Oregon, it will also impact the availability and cost of student housing, parking, and more. 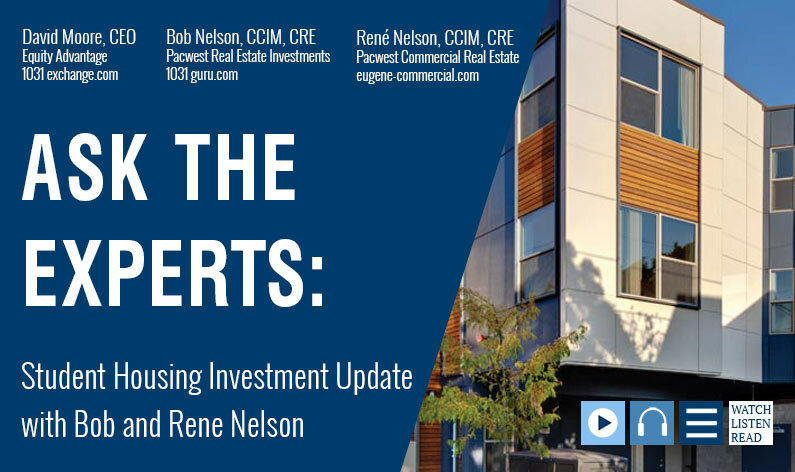 In this episode, David Moore with Equity Advantage welcomes René Nelson with Pacwest Commercial Real Estate Investment and Bob Nelson with Pacwest Real Estate Investments to discuss the potential outcomes. David Moore here for another episode of Ask the Experts. I’ve two wonderful, wonderful experts here today with me: Rene and Bob Nelson. I have had the pleasure of knowing Bob for, how many years, probably almost 30 years. Bob Nelson: Speak for yourself. Once again, David Moore with Bob and Rene Nelson, and here to answer your questions. If you’re considering student housing investments as apart of a 1031 Exchange, contact the experts at Equity Advantage today: 503-635-1031.